This winter trekking trip in Morocco takes you among the snow-capped peaks and stunning landscape of the Atlas Mountains to the summit of Jebel Toubkal. On a clear day enjoy views across the Atlas range and towards the Sahara Desert. Join your tour in Marrakech. The city is the spiritual heart of Morocco, the cultural melting pot of the mountain Berbers and the desert peoples of the south, whose eclectic mix of ideals and traditions has resulted in a fascinating clash of colour, noise and visual delights that is straight out of the Arabian Nights. Depending on the schedule of your flights, you may be able to start exploring the souks of the Red City independently before meeting your group and Tour Leader at the hotel. After most of the morning free in Marrakech, we leave the city behind and drive south towards the craggy peaks and plunging valleys of the Toubkal Massif. Crossing the Haouz Plain we pass through the tiny town of Asni, from where our road begins to climb towards the foothills of the Massif. Below us the valley of the Oued Rhirhaia stretches out into the distance and small villages cling to the sides of the steep hills as we meander our way towards the village of Imlil. Here we leave our vehicle and in the company of our tour leader, assistant mountain guide and cook, head along the Mizane Valley towards the Berber village of Aremd (2000m). Built on a moraine spur overlooking the valley floor, Aremd is the largest village in the valley and provides an interesting mix of traditional terraced farming, gites and streets that seem to be permanently gridlocked by goats and cattle. For generations the local Berber villagers have worked these lands, producing corn, potatoes and walnuts from the harsh landscape and we will have a chance to explore something of the village en route to our overnight accommodation, stopping for a refreshing mint tea along the way. Please be aware that our village accommodation will be basic, with shared facilities and dormitory style rooms. Today's one and a half kilometre walk is expected to take around one hour with a total ascent of 210 metres. This morning we meet up with our mules and muleteers for the continuing journey through the mountains. Heading east and crossing the flood plain, our route takes us along mule tracks and up into the high rocky cliffs above the valley. Crossing the river we eventually come to the pastoral shrine of Sidi Chamharouch (2340m), which attracts tourists and pilgrims alike (although only Muslims are allowed to cross the stone bridge to visit the marabout shrine itself). The village sits besides a small waterfall and presents a jumbled cluster of houses that seem to melt together into a chaotic mass along the valley walls. Continuing up into the snow-line it will take us another 5 hours to reach the refuge. After a chance to rest we'll then do another equipment check, practising on the surrounding snow covered slopes and receiving some basic instruction on the use of crampons and ice axes from our mountain guide. Today's nine and a half kilometre walk is expected to take around five hours with a total ascent of 1257 metres. If conditions are right this morning we will make our first attempt on the summit of Jebel Toubkal, North Africa's highest mountain. It will be an early start, a long day and a steep climb, as we make our way up a meandering track of snow and scree to our first stopping point at 3700m. From here we turn left, following the slope up to the South Col of Tizi n' Toubkal (3975m), from where we follow the snowy ridge to the summit. Depending upon snow conditions, the journey to the top should take us around 4 hours and once we hit the summit the views that greet us are simply breathtaking. On a clear day you can see the entire Toubkal range, right down to the plains of Haouz surrounding Marrakech. 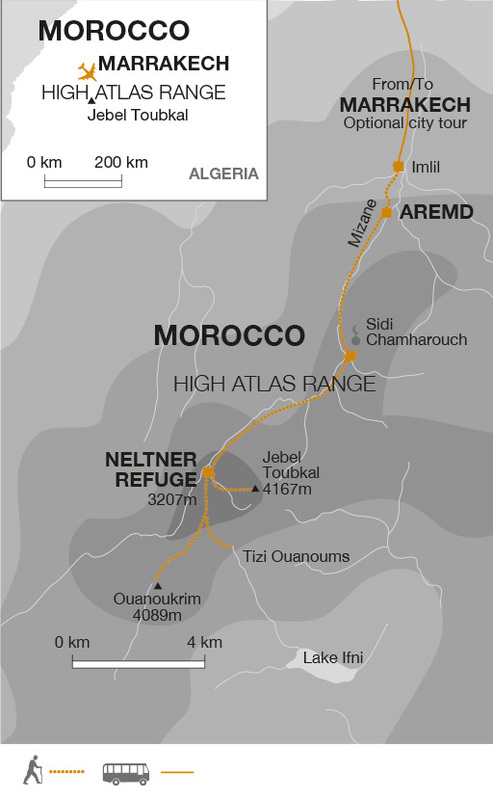 To the north lie the white giants of the High Atlas and to the south, the Anti Atlas and the Sahara. Pliny, the great Roman scholar, once described the High Atlas Mountains as the most fabulous mountains in all of Africa and from our vantage point high above the valley it is easy to understand why. Descending to the Neltner Refuge from here, the journey back should take us around 2.5 hours, where a late lunch will be waiting for us. Assuming conditions yesterday were right for the ascent of Jebel Toubkal, this morning you may like to attempt the nearby peak of Ouanoukrim, a more demanding climb than Toubkal with some steep, exposed sections of rock and snow. Departing the lodge early, we follow a gradually climbing path that takes us towards Tizi n'Ouanoums and then on to Tizi n'Ouagane (3750m). Chances are we will encounter snow for much of the journey and, as we begin the ascent to the top from Tizi n'Ouagane, we will have to negotiate a rocky track that may require some scrambling. Once past this section though, the route to the top then continues along a steadily climbing slope of snow and scree to the summit, from where we are rewarded with more spectacular views across the Anti Atlas and the Sahara. Enjoying a picnic lunch en route, the entire journey should take us around 8 hours, depending on conditions. Today's six kilometre walk is expected to take around eight hours with a total ascent of 882 metres and a descent of 882 metres. This morning we follow the same initial route as for Ouanoukrim before turning left up a steep gorge to Tizi Ouanoums, a viewpoint affording stunning views down towards the still waters of Lac D'ifni. The total journey should take us around 3 hours, returning to Neltner for lunch. Afterwards we turn our back on the mountain for the last time and head back down to Aremd, arriving in the village late this afternoon. Depending on our arrival time, there may be time for an optional visit to the local hammam. Today's 13.5 kilometre walk is expected to take around seven hours with a total ascent of 400 metres and a descent of 1650 metres. the option to take an afternoon walking tour around the souks with a local guide, visiting the museum and the elegant Koutoubia mosque and tower, reputed to be the most perfect Islamic monument in North Africa. Alternatively you may prefer to spend your final afternoon independently exploring this maze of narrow streets, enjoying the sounds, colours and smells of the exotic and perhaps haggling for some last minute presents. Or perhaps you'll prefer just sitting in a local café and watching the street tableaux unfold before you. 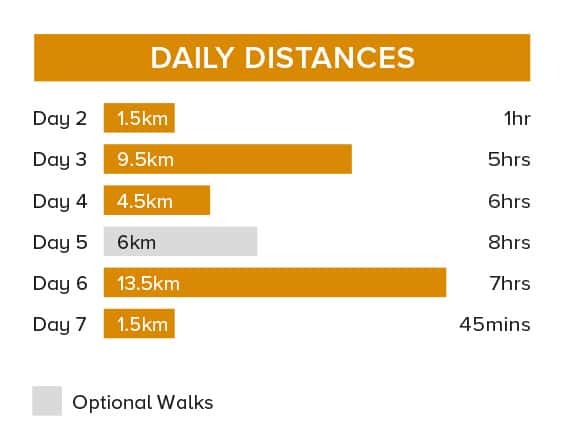 Today's on-and-a-half kilometre walk is expected to take around 45 minutes with a total descent of 210 metres. The tour ends today in Marrakech. Depending on the schedule of your flights you may wish to spend some additional time wandering in the market and buying your last souvenirs before departure. -Warm jacket and trousers - After sunset and before sunrise, temperatures can fall. A warm jacket and long warm trousers are the most convenient way of keeping warm, a down jacket is recommended. -Breathable wind and waterproof jackets and trousers - Material such as Goretex not only protects against rain and wind, but also stops you from overheating. They 'breathe' and avoid condensation that you will experience from nylon waterproofs. -Thermal underwear/base layers - Long sleeve tops and long john legging thermal underwear, cotton clothing like t-shirts are not suitable or recommended as a base layer as they do not wick away any moisture from the skin. -Waterproof gloves; a warm scarf & a warm hat - Warm and windproof gloves or mittens are essential. Also bring a scarf to cover your neck and a warm balaclava or a warm hat. We recommend you bring strong and waterproof mountain trekking boots with a stiff sole.. Make sure that your boots are worn-in and comfortable before the start of the trip. Also trainers or sandals for relaxing and general wear. Crampons - Bring your own if you have them or these can be hired locally for MAD300 (approx. £20) each for the duration of the trip. They can go on any type of walking boot. Please advise us if you would like to hire this equipment locally so we may add a note to your booking. Gaiters are useful to keep snow and scree out of your boots and bringing spare boot laces is advised. You may choose to bring trainers which will be useful in villages and general wear. We suggest that you bring a soft, waterproofed holdall/barrel bag that will be carried by mules on trek and good size waterproofed daysack plus a small holdall to store unneeded items in Marrakech. Pack mules are used to carry equipment, food and most personal gear. To ensure the well being of the mules please do not over pack your luggage. It will be possible to store surplus baggage not required on the trek at the hotel in Marrakech. 3/4-season sleeping bag - 4-season comfort rating (temperature -10 degrees celcius to -5 degrees celcius) or a 3-season with a separate liner. A silk or fleece liner helps to keep your bag clean and adds an extra season. Personal first aid kit - On each trek a first aid kit is carried but you should have your own blister kit, supply of plasters, aspirin and other essentials. Please do not give medicines to local staff without consulting the tour leader. Trekking poles are recommended, particularly for the descent from the summit of Toubkal. Please note that an ice axe can be hired locally for MAD300 (approx. £20) each for the duration of the trip. Please advise us if you would like to hire this equipment locally so we may add a note to your booking. Equipment Hire and Trek Training Days in the UK - Trek Hire UK hire out a wide range of kit including quality sleeping bags, down jackets, walking poles and crampons. http://www.trekhireuk.com. They also run regular trek training and preparation days from their base in the Surrey Hills, ideal for getting an indication of your overall fitness level and also covering advice on kit and altitude. Accordingly, you should allow approx. £30 per person for tipping of crew and local guides used. On day two and six you stay in a traditional Berber village house. There are number of twin or triple rooms with shared facilities, and a communal area for eatingocialising, and roof terrace too. All bedding is provided. These are a fantastic way to meet the local Berber people and gain an insight into their lives. Day three you stay at Neltner refuge. The rooms are basic dorm rooms with bunk beds (ear plugs recommended!). There is no bedding provided. There are shared toilet facilities (take your own toilet roll). There are showers, which may or may not be hot. There's a dining room and large lounge area with a wood burning stove, where everyone gathers and socialises in the evening. Please be prepared to pay extra for the hot showers, wood (for the fire) and bottles of water. It's a great way to meet like-minded trekkers from all over the world. Trek on 3 days for between 5 and 7 hours. Snow and ice underfoot, ice axe and crampons are used, it is recommended that you know how to use these. We follow the Ikhibi Sud route up the mountain, trekking up the north side. This is the main trekking route as it catches a path through a U shaped valley towards the Toubkal Pass before continuing to the ridge and the summit. There is an alternative south side route but this is steeper and has more difficult narrow sections.